Good interior designers are without doubt creative but must also have sound basic mathematical skills. Putting together a beautiful room design requires a good understanding of size, scale and proportion and how different colours, textures, materials and patterns impact on these; all principles of geometry. Geometry is the visual study of shapes, sizes, patterns and positions and is important in so much of human life. In architecture, machinery, navigation, art and design, geometry forms the foundation of how we live. Simple shapes like the circle, square and triangle, secondary forms such as half circle, diamond and trapezoid and extruded forms such as spheres, cubes and pyramids are featured in design throughout history. From the sacred geometry of the golden ratio to the Egyptian pyramids, from the grand architectural structures of ancient Rome and Greece to modern buildings such as the Sydney Opera House, from cubism to abstract art and from retro to contemporary home décor, geometry defines the synergistic relationship we have with our environment. Deciding on a layout starts with an understanding of the room’s function; is it single-purposed or a space that has many functions? Although creating symmetry in a room allows for natural synergy, function trumps form and basic geometric principles must be put in play to marry the two. In a space that needs to accommodate various purposes i.e. relaxing, conversation, watching television, study etc. use geometric shapes to define unique areas within the space. In the below interior design, the alcove creates a separation between the communal seating area and a more private space for reading or relaxing. The strong lines of the squared off space soften with the more gentle curves of the chairs and the free form of the indoor plant. Strategic placement of artwork and area rugs also work well to define separation in an open-plan room. AMERICAN shutters’ marketing manager and interior designer, Karina Palmer adds “ allowing natural light into a room with unique architectural features accentuates the geometry; shape and structure, and adds interest in the changing light when shadows move and lengthen.” Shutters, which have their own strong geometric appeal facilitate full light control; degrees of light penetration are controlled by opening or closing the louvres or opening and closing the shutters themselves. When analysing a space for interior design, the entire space needs to be taken into consideration; floor space, ceiling height, window size and doorways. This will inform your choices of furnishings and finishes. Using large furniture pieces in a small space creates a disproportion that results in an awkward impractical room, using multiple small pieces in a large space results in a cluttered, confused look that is disconcerting. But although size does matter, it is also important to look at proportions; how different pieces work with one another i.e. 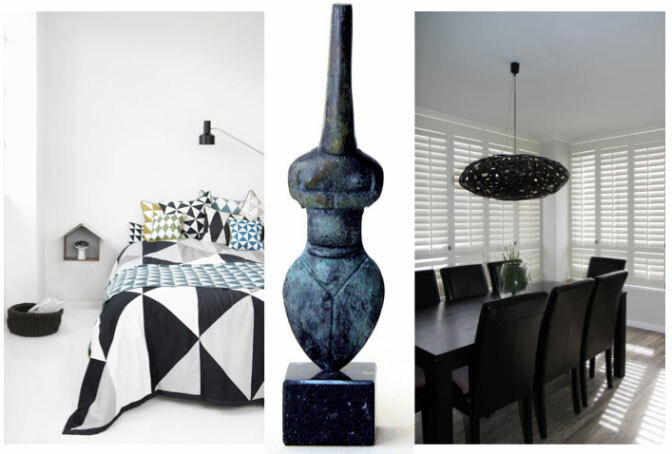 opting for a large designer sofa as your centrepiece, then choosing a glass coffee table to fulfil a purpose but not steal any glory from the sofa or keeping your décor accessories minimal to allow the drama and stature of strong geometrical elements such as the below light fitting in the dining room, to stand out. 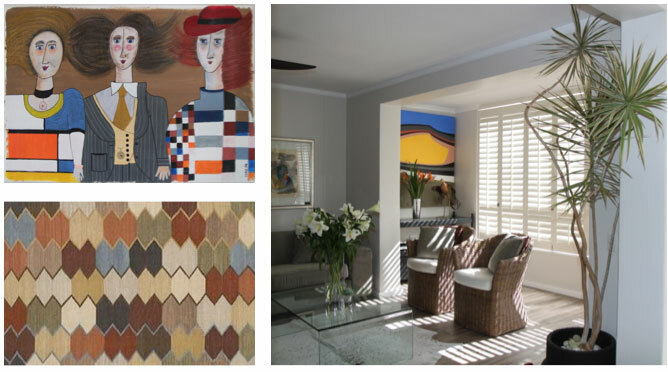 “Using similar geometric shapes in a room either in a repetitive sequence or layered in varying sizes and colours will create a harmonious slightly hypnotic space that relaxes and revitalises while combining different geometric shapes accentuates their differences and creates drama and interest,” says Karina Palmer. 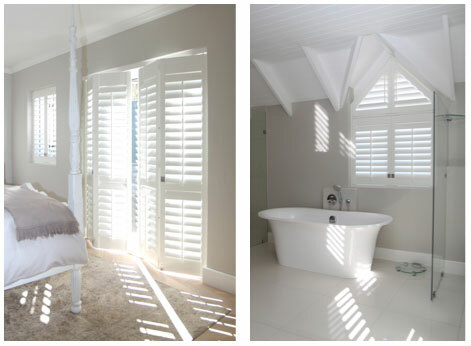 Shutters and blinds have strong geometry, the vertical lines of the louvres can add to a striped-themed room whether subtle or bold as shown in the images below. This effect is minimised or enhanced by the simple effortless versatility of the shutters and blinds, “closing the shutters and louvres creates a neutral backdrop on which the room’s interior design is accentuated, but opening the louvres adds a completely new dimension to the space, one that is further exaggerated when light and shade are invited in to become décor elements of their own,” adds Karina. 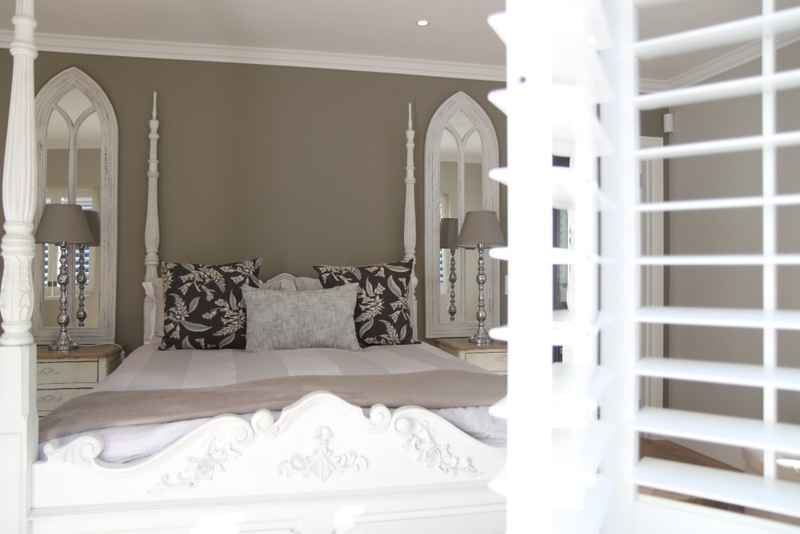 Get your home in shape with clever use of both your creative and mathematical talents and AMERICAN shutters and blinds to introduce the form, symmetry, interest and style of geometry into your interior design.